The Los Angeles Chargers cut 28 players Sunday to reduce their roster to the 53-player regular-season limit, including backup quarterback Kellen Clemens and Josh Lambo, their kicker the past two seasons. Other players cut included safety Dwight Lowery, who has played nine seasons in the NFL and started all 16 games last season; nose tackle Ryan Carrethers, who played 24 games with the Chargers over the past three seasons, starting three; and running back Kenjon Barner, who signed with the Chargers in March as a free agent after playing the past two seasons in Philadelphia. Tight end Jeff Cumberland was also cut. He missed the entire 2016 season because of Achilles tendon injury suffered in the second preseason game. Cumberland signed with the Chargers in April 2016 after playing the first six seasons of his NFL career with the New York Jets. 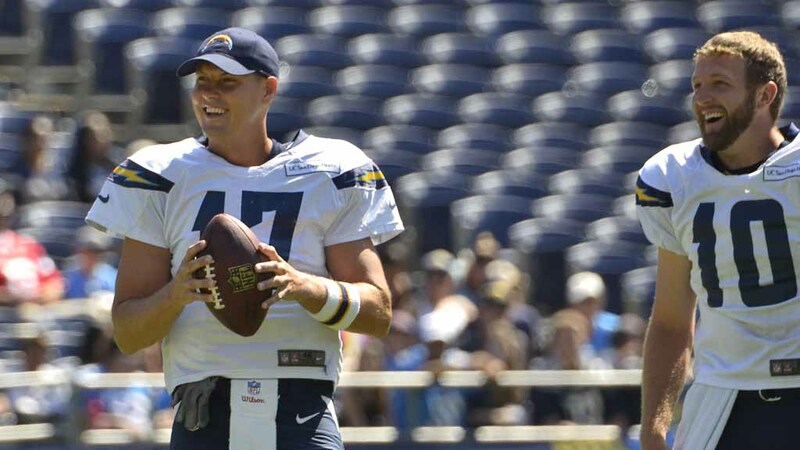 The cutting of Clemens and Mike Bercovici leaves starter Philip Rivers and the recently acquired Cardale Jones as the Chargers only quarterbacks. Clemens spent the past three seasons with the Chargers, throwing 10 passes. He played in the Chargers first two preseason games. He had two passes intercepted and botched a handoff in a 48-17 loss to the Seattle Seahawks Aug. 13. Thc Chargers were scoreless in their seven first-half possessions with Clemens as quarterback in a 13-7 loss to the New Orleans Saints Aug. 20. The only kicker remaining on the roster is undrafted rookie free agent Younghoe Koo who played college football at Georgia Southern. Cornerback Trovon Reed, defensive tackle Caraun Reid and running back Andre Williams were the only other healthy players with NFL experience cut. Six players with NFL experience were waived with injury designations, allowing the team to place them on the injured reserve list if they clear waivers — receiver Isaiah Burse, offensive tackle Tyreek Burwell, guard Donavon Clark, defensive tackle Kale Eulls, running back Kenneth Farrow and linebacker Joshua Perry. Six players in addition to Bercovici who participated in previous NFL training camps were also waived — guard Brett Boyko, wide receivers Da’Ron Brown and Jamaal Jones, linebacker Kyle Coleman, cornerback Randall Evans and tight end Matt Weiser. Ten undrafted rookie free agents were cut — punter Toby Baker, cornerbacks Michael Davis, Ryan Reid, Brandon Stewart and Brad Watson, tight end Mike Estes, center-guard Barrett Gouger and receivers Mitchell Paige, Andre Patton and Cameron Posey. Defensive tackle Tenny Palepoi and center Max Tuerk were placed on the reserve-suspended list and guard Forrest Lamp on the injured reserve list. All NFL teams were required to reduce their rosters to the 53-player limit before 1 p.m. Saturday. Teams often make changes to their rosters between the time they are required to get to the 53-player limit and the start of the regular season as they sign players cut by other teams and cut others to make room for them on their rosters. Teams may begin signing players to the 10-player practice squads Sunday.